Three magical words: Disney-inspired weddings. Nothing more, nothing less. When you find your one, your story will beat that of any fancy princess out there. However, your wedding is a (very) special occasion. It is an opportunity to live your wildest fantasies with the people you care about the most, including creating your own magical universe. 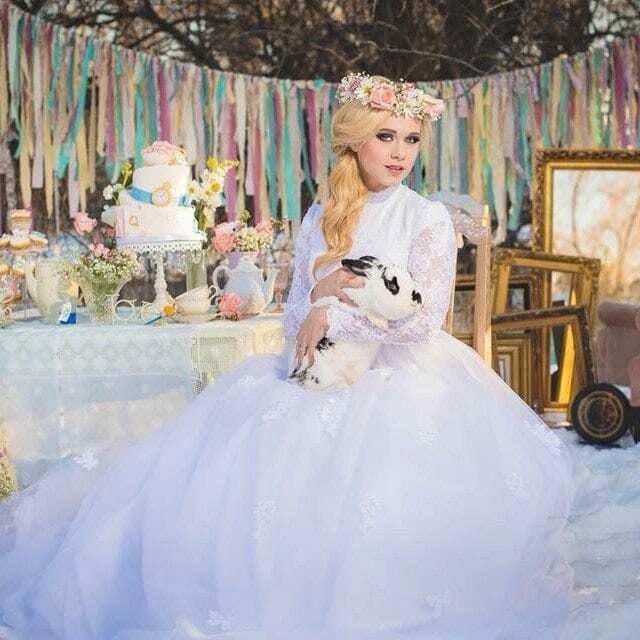 If your idea of a fairytale-like experience is a Disney-inspired wedding, enjoy 21 wedding photos that will give you major princess vibes! This is a pitch-perfect photo. 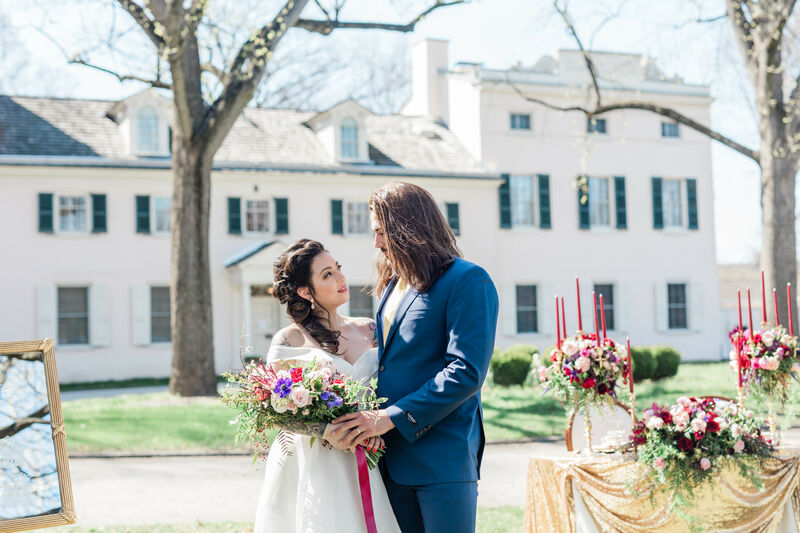 The groom’s long hair and blue suit recreate the Beast’s outfit flawlessly, and the bride’s side-braided hair reminds us of Belle’s hairdo. The table behind them sets the tone to a Beauty and the Beast wedding theme. How you can do it: Put a golden sparkly tablecloth on your tables. Add a couple of candelabras and porcelain teacups. 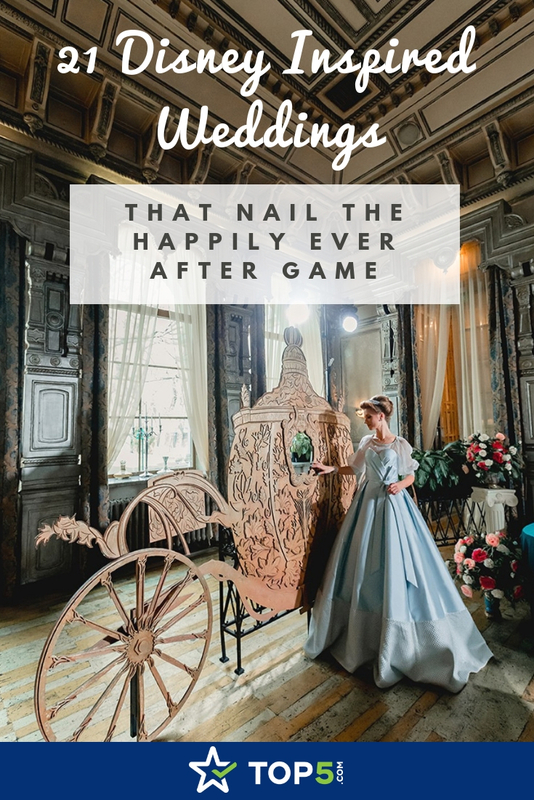 When planning Disney inspired weddings, it is ideal to pick your favorite movie scene and recreate it. The famous ballroom scene remains in the minds of many the epitome of romance — especially after Emma Watson gave it a fab kick. This couple took a run with it, and it came out perfect. How you can do it: Many hotels have this kind of stair arrangement in their lobbies. Do a quick Google image search of the hotels in your area to see if they have the same. When you find the kind of staircase you need, call the hotel to ask if you can schedule a quick photoshoot there. 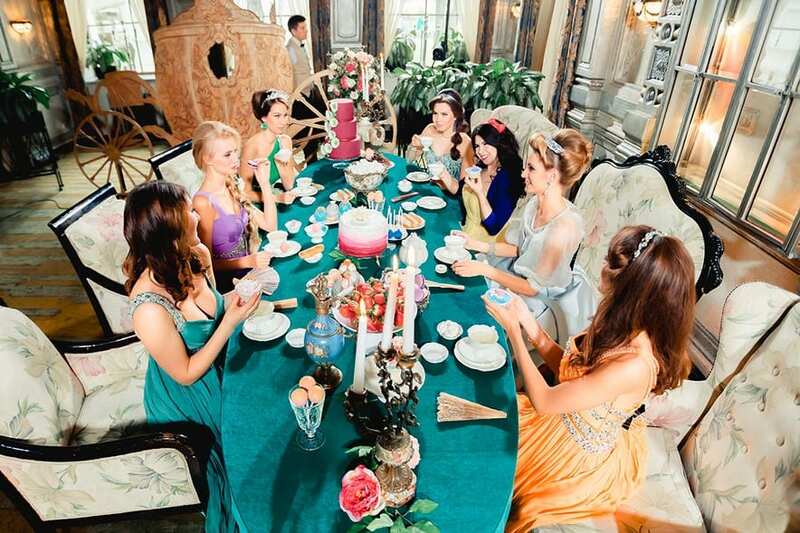 Having your BFFs dressed as fellow Disney princesses is a dream for many. And this is a dream that Nikita and Valentina made true for their wedding. 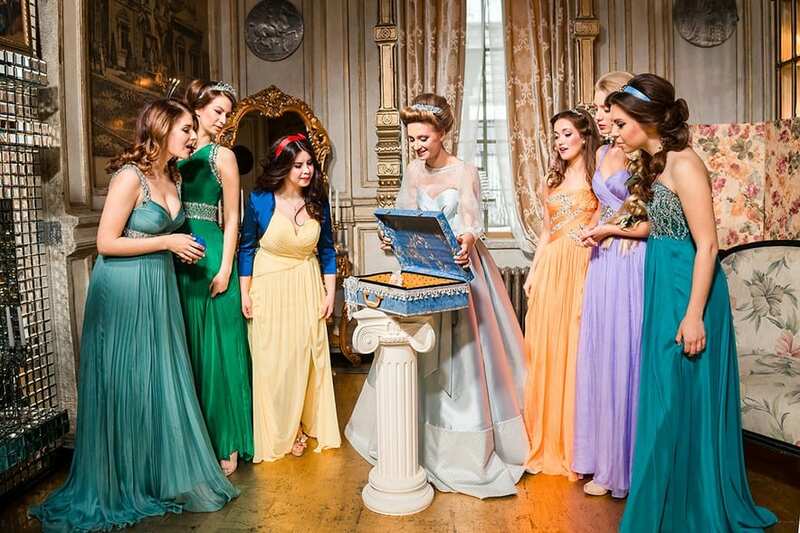 How you can do it: You can either go full-on and design a separate dress for each one of your bridesmaids, or they can all be dressed the same and carry a Disney princess-specific item. For example, a fork and fish figurine for Ariel, a tiger figurine for Jasmine, a white shoe for Cinderella, an apple for Snow White and so on. Cinderella’s story revolves around the little glass slipper. So how about you give it a go too? 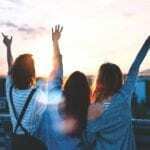 Have your bridesmaid squad help you get the most epic pic of all time! How you can do it: Order a glass shoe from Amazon, put it in a nicely decorated box and give your most genuine surprised look to the camera. Hop on to discover the most exquisite carriage picture we’ve seen in a while. The best part of it? Because it’s so thin and transportable, you can move it pretty much anywhere you want, getting you and your guests some pretty sweet shots. How you can do it: This carriage is made out of wood to ensure it stands still. You can have the same one made by a professional woodworker. 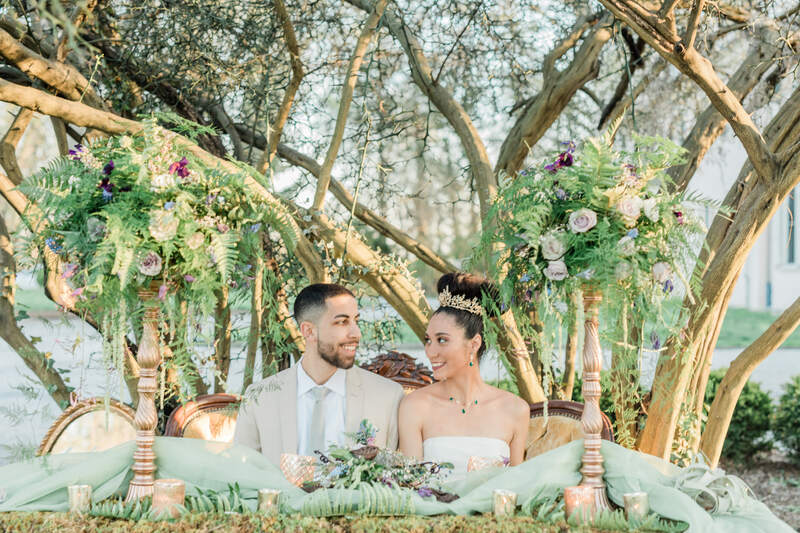 Don’t let your dream Disney-inspired wedding go! If you’re a fan of Frozen, blue is the theme color to choose. There are also some more details you can choose to make it a success. 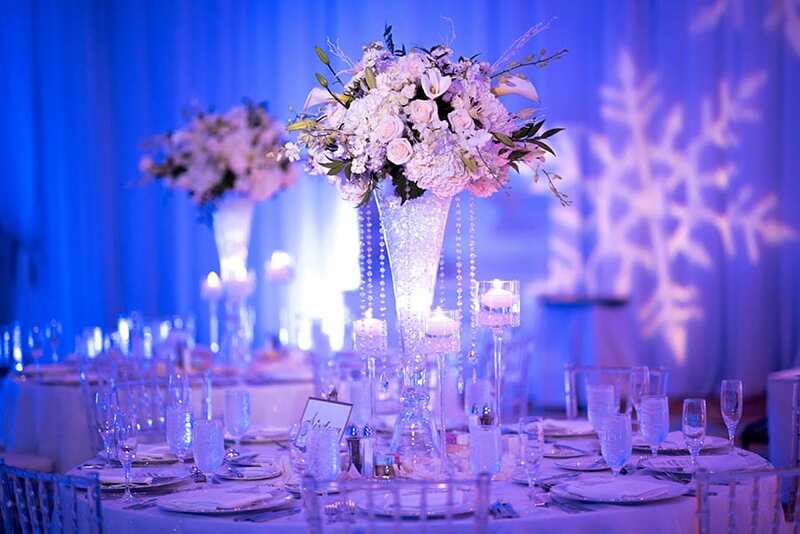 How you can do it: Everything in the picture above conveys snow and ice: the shining glasses and glass candle holders, the blue lights in the ceremony room and the big snowflake projections. These details can be easily replicated. All you need is faith, trust a little bit of pixie dust — and a little plaque that says “Neverland” to seal the deal. How you can do it: Here are all the little details you can use to turn any normal picture into a Neverland fairytale: a pirate hook, a dagger, a Peter Pan book and a handmade plaque that says “Neverland”. 14.) 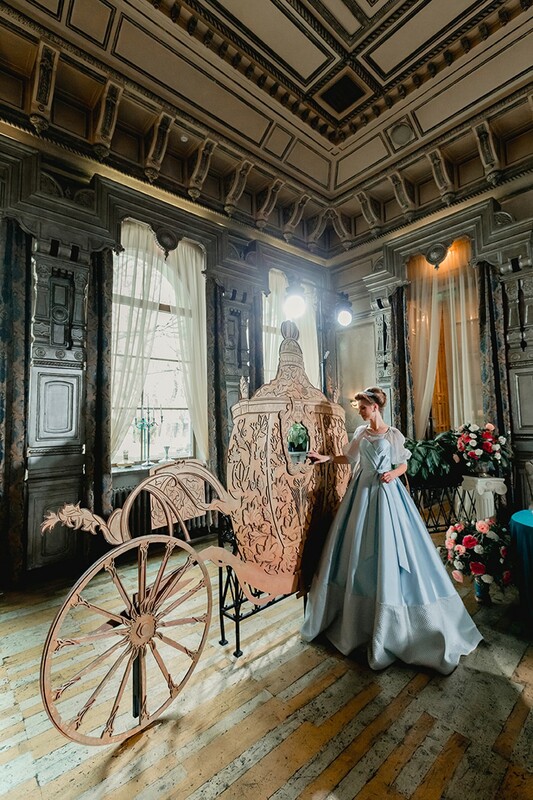 Magic Mirror on the Wall, What’s the Best Disney Wedding Decor? No need to ask a second time, we have a strong contestant right here. 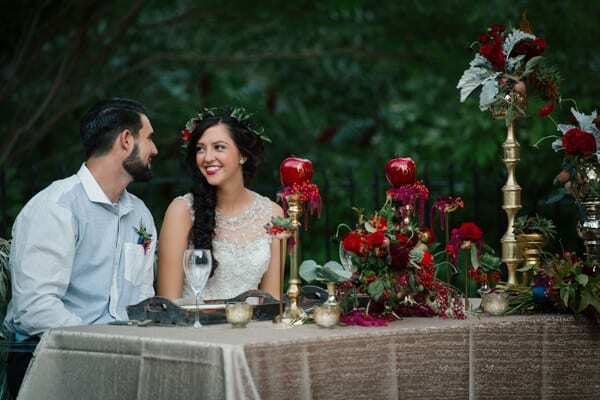 The bride can wear her brightest red lipstick to celebrate the occasion and rock a photoshoot in front of a Snow White themed table. How you can do it: A striking blood red will be your choice. 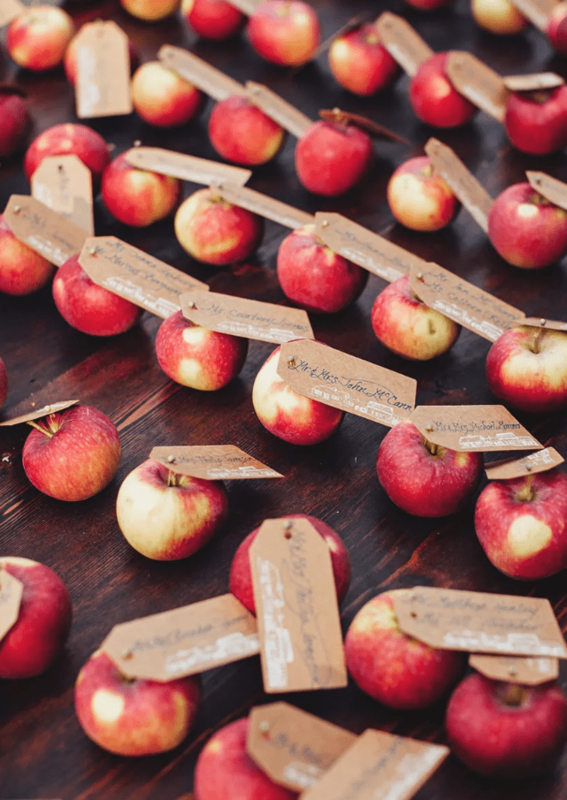 Make a splash by ordering artificial apples and writing the couple’s names and guests’ names on them with a gold marker. 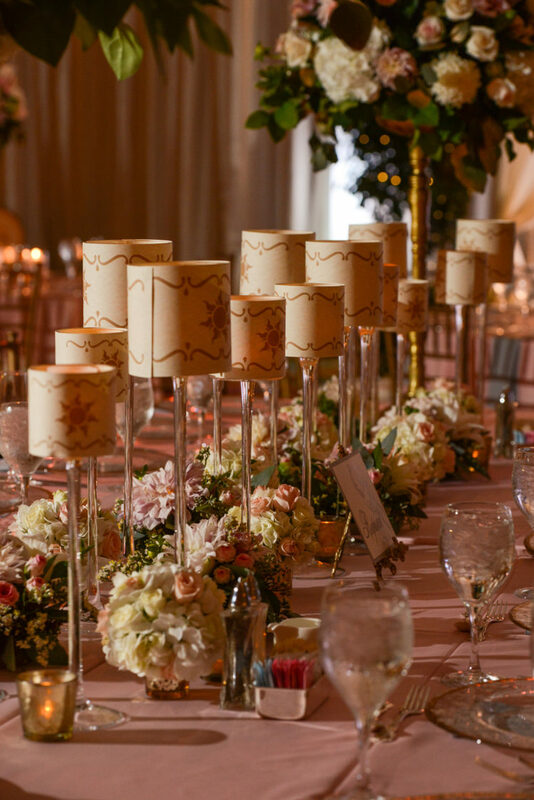 Disney-inspired weddings stay on the theme from start to finish, and this a great example of how you can do it too. How you can do it: In addition to the table seating apples, pop flower assortments that combine red and green flowers and some cranberries. For a little wink to the story, try to seat 7 guests per table. If you’d like to keep all natural, these apple table pointers will enchant all your guests. How you can do it: Either print the cards after designing them yourself, or write on each card yourself if calligraphy if your forte. 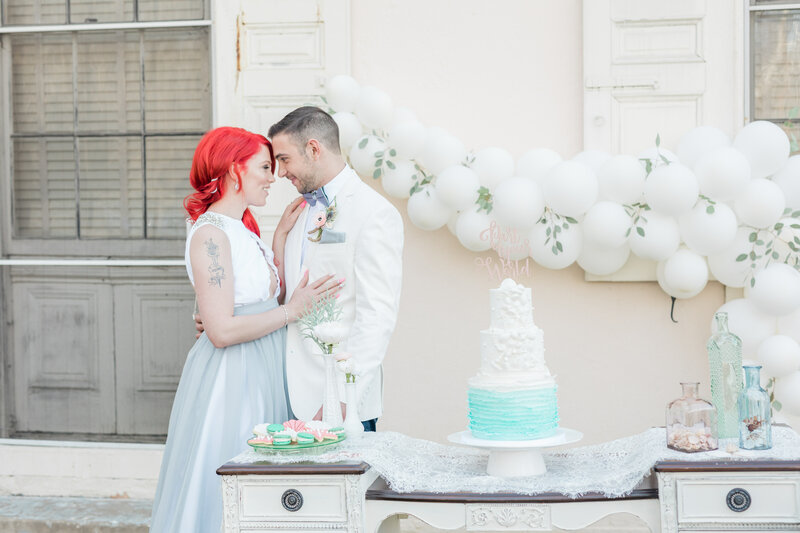 We’re losing our voices at this gorgeous sight: the flame-haired bride with pearl accessories, the mermaid-like pastel dress, the white tux of the groom and the beautiful blue and white cake. How you can do it: We’re head-over-heels for the simple yet eye-catching balloon assortment in the background. Make your own by adding strapping white or translucent balloons to a wire and adding artificial (or real) thin branches here and there. 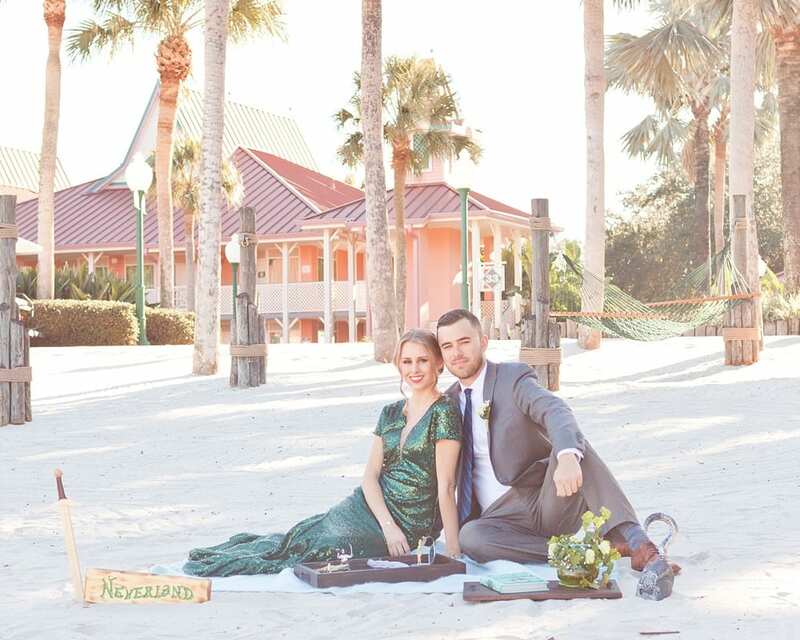 Disney-inspired weddings aren’t just about the lead characters of the stories. People also get inspired by the places these stories happen. An ocean-themed table will enchant your guests and remind them strongly of The Little Mermaid. 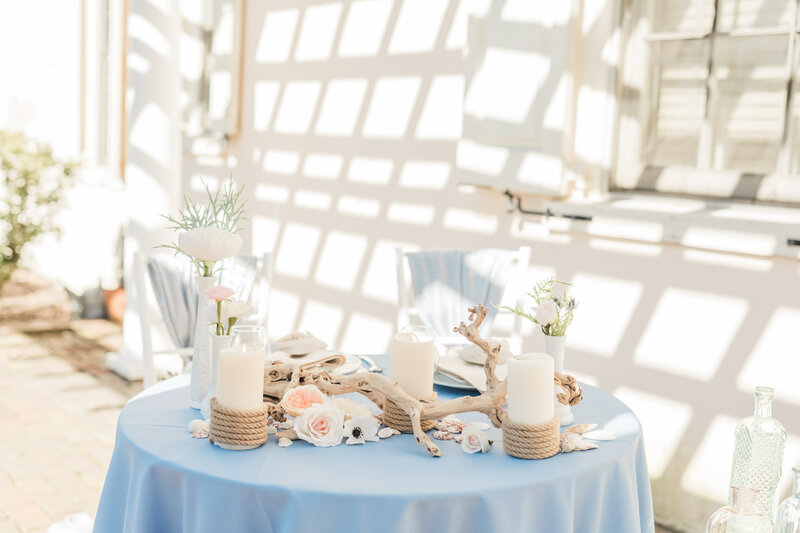 How you can do it: Use seashells scattered on the table, a pastel blue or ocean green tablecloth, roped up candles and linen napkins. That’s all you’ll need. 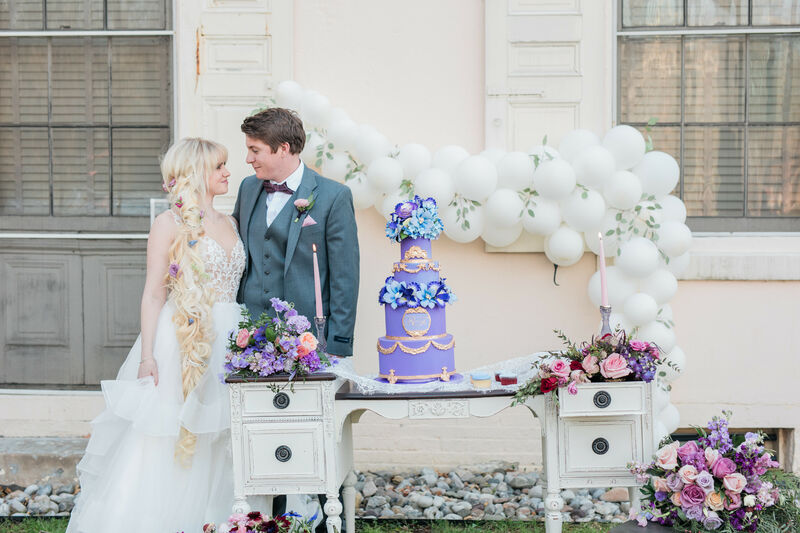 A Tangled-inspired wedding is a wedding where you need to let your hair down — both literally and figuratively. How you can do it: Give everyone major Rapunzel vibes by braiding your hair and adding flowers and pearls to it. Got shorter hair? No worries, you can re-enact the final wedding scene from Tangled where the princess had short, brown messy hair. 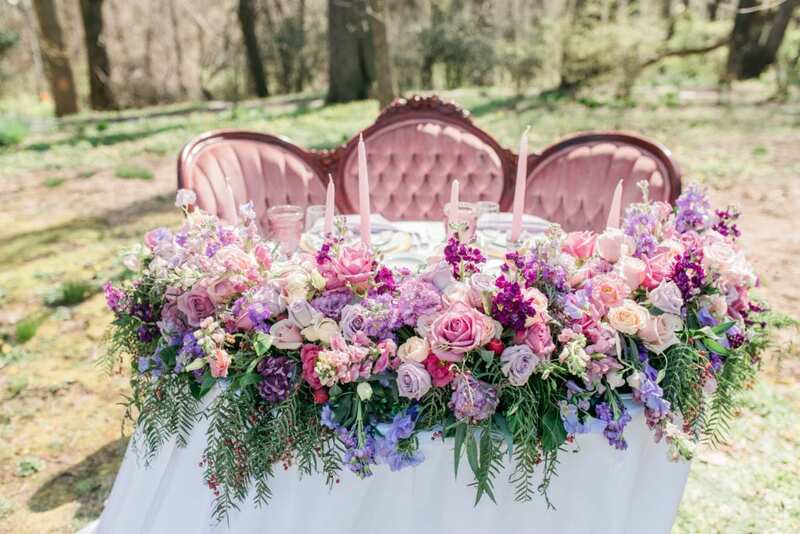 Disney-inspired weddings are made of pastel colors and gorgeous flower arrangements. Look at this table. We would fill our camera roll with only pictures of these beautiful flowers. How you can do it: Soft purple is your color of choice. Use it and overuse it; it’s a color that doesn’t pop too much. Light up the way and bring the Festival of Lights to your table with these lantern candle holder decorations. We love how such a simple DIY can help bring the Disney theme together. How you can do it: Cut brown paper in a rectangle that can go all the way around your candle holders. Stencil the Tangled sun symbol with paint using this template. Does the happy couple identify with the strong and ambitious Tiana? If yes, then it’s time to plan a very lush green wedding. How you can do it: Gold and green are a match made in heaven. Choose gold decorations for your tables and add all sorts of flowers and shrub leaves. A green table runner will bring everything up nicely. Mirror, mirror on the wall, what can I add to have the nicest themed wedding of them all? 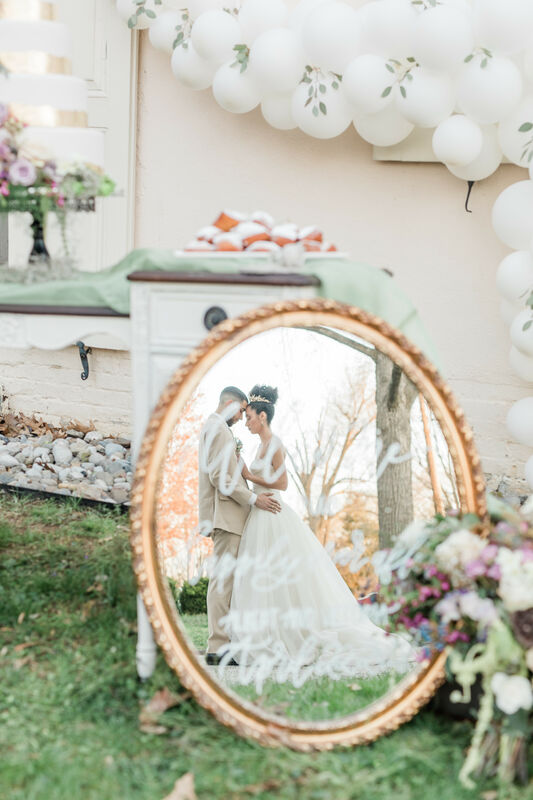 Our answer is fairly simple:a round fancy mirror with your wedding’s date to have everyone reflect on this joyous occasion for many years to come. How you can do it: Two ways. You can write the couple’s names, the wedding date, and a “Happily Ever After” message using a liquid chalk marker or you can use a decal. 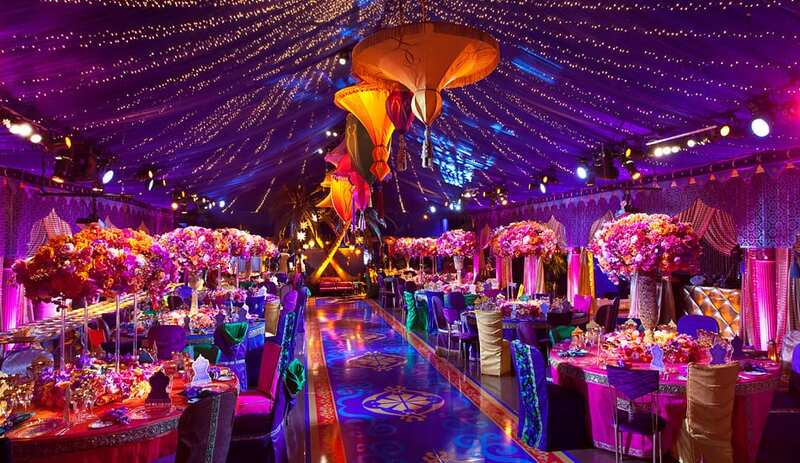 Disney-inspired weddings, meet Arabian night dreams. The result? 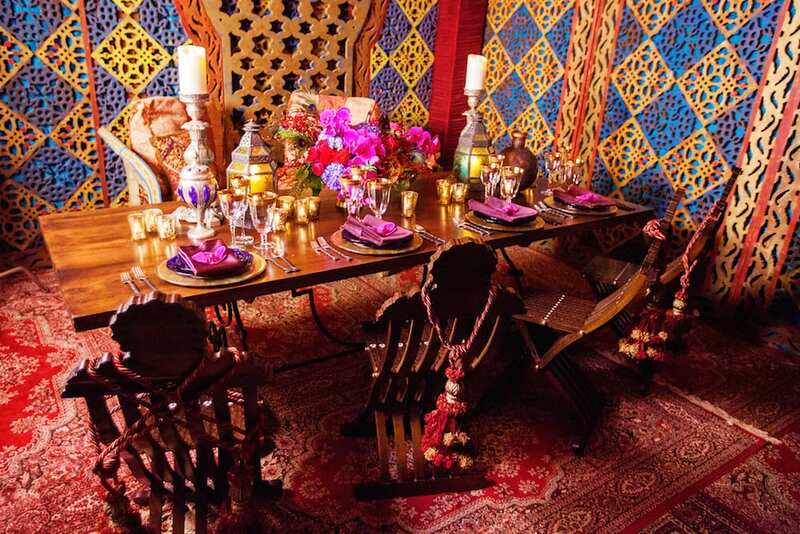 An enchanting set-up worthy of the Thousand and One Nights! How you can do it: Use these decorations to get the effect you’re hoping for. A Moroccan temple tower candle holder, a blue glass hanging candle lantern and a sparkly gold tablecloth. Light game? Strong. Decoration game? Epic. This is set to be an epic party. 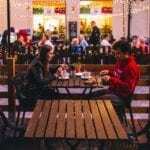 How you can do it: This kind of setting works best in a closed space. In the picture above, it seems like it the couple used a mega-tent to host their wedding. If you are having your wedding in a ceremony room, you might want to give it a go. Use large fabric pieces and string lights attached to the ceiling, a combo of yellow-blue-red lights and flamboyant colors to get the look going. The rabbit might be late for his appointment, but our bride is right on time to get the party starting. The decor behind her is absolutely gorgeous and will help make an unmatchable photo album. 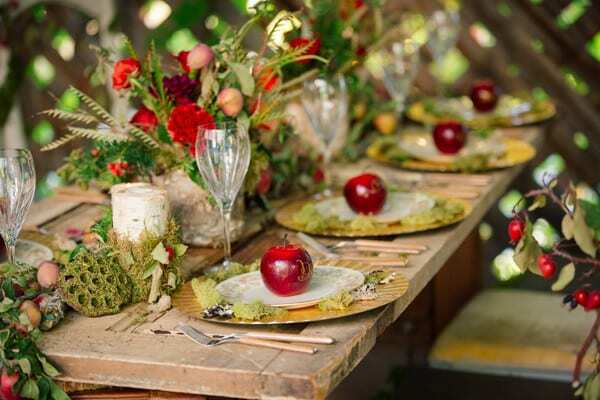 How you can do it: Aim for a table setting that would make the Mad Hatter happy. 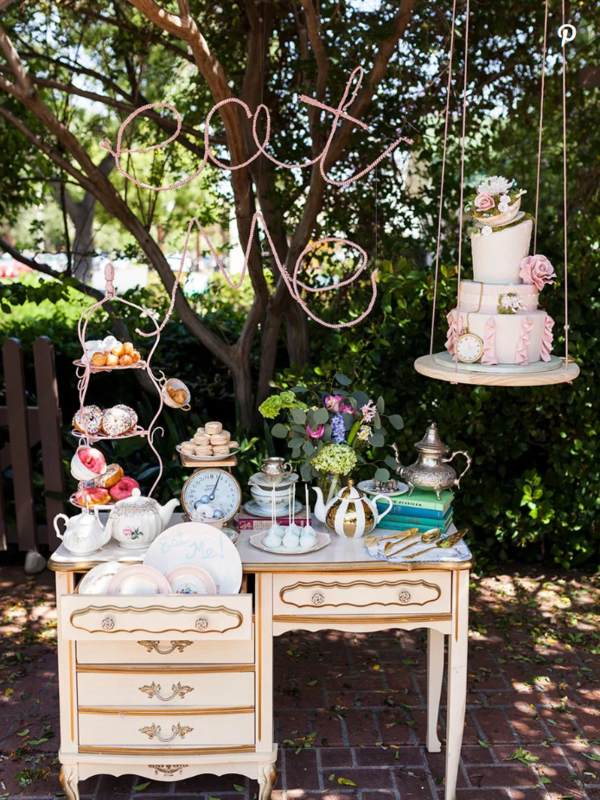 A Wonderland-inspired wedding cake, various teacups, tea-pots, small cupcakes and a few small and discreet flowers will get you started. Bonus point if you can get a small rabbit to take pictures with! Now we’re going all in! These table decorations are so spot-on that we might not be able to wait until a wedding to recreate them. One detail catches our attention though: the “Eat Me” hanging sign. How you can do it: Write the words “Eat Me” in a big piece of paper. Get a bendable wire and try to shape it following the words on the paper. Once you’re done, wrap it gradually in a circular motion, using fabric and glue. 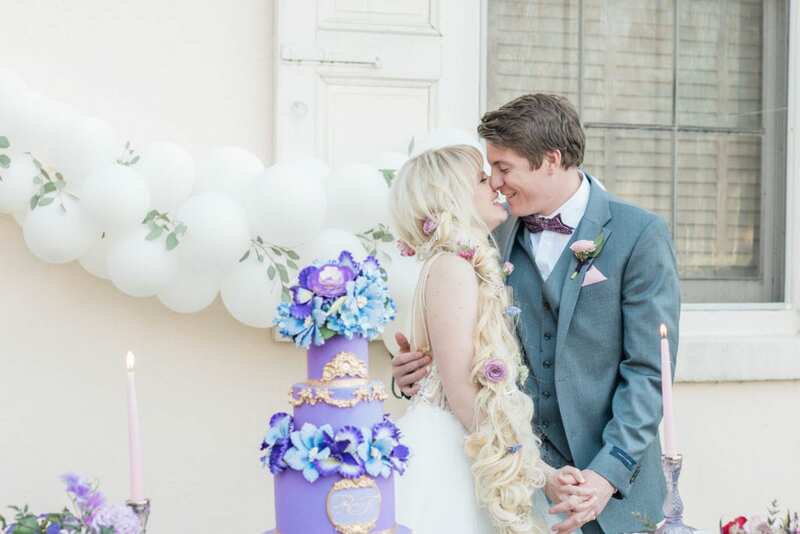 What do you think of these Disney-inspired weddings? What’s your favorite one? Let us know in the comments! If you liked these Disney inspired weddings, you might want to add a touch of the unexpected to your wedding as well: pet cake toppers! Read our next article to discover more.